January can be a tough time for roving, even here in the Pacific Northwest. For instance, two years ago, we got a bunch of snow several days before the January VHF contest began. In, say, Chicago, a few inches of snow would have been a non-issue. But in Redmond Washington, I couldn’t even get my car out of the driveway and onto the street until Saturday. Even last year during the January VHF contest the fog was so thick and weather cold that I got massive ice build-up on the leading edge of my antennas as I drove down the highways. I had to de-ice antennas. Even when it is not snowy at low elevations, the best roving spots over two or three thousand feet MSL were off limits because of snow. This January was totally different. Two weeks before the contest, the Snoqualamie Pass traffic cameras showed snow at 3,000′. And the National Water & Conservation Center’s mountain snow sensors showed plenty of snow at 3,000′. I figured my favorite elevated spots were out. Then warm weather moved into the area and the snow level sensors dropped to zero. Installing lots and lots of gear in the truck wasn’t too unpleasant for a January. Friday evening before the contest, I scrapped my low-elevation plans and re-planned beginning with my route from the September 2013 VHF contest. Aside from one litle fog-induced misadventure, the weather was, really, quite perfect. Alas, competition with a football playoff game was a little more severe this time. Preparations began the weekend before the contest. A break in the rainy weather Sunday afternoon gave me a chance to install the masts and antennas, and pull bundles of coax to the front and rear antenna stacks. Assembling the rack was simple, as it was the same as last September. I picked away at rack construction and installation for the rest of the week. Most things seemed to happen on Friday evening. An Elecraft XV-222 222 MHz transverter, not visible, but hanging on the lower left side of the rack. A Yaesu FT-857D for 2 meters and 432 MHz SSB and CW (remote head on the dash). An Alinco DR-590 dual band 2 meter, 440 MHz rig for FM simplex. An Alinco DR-M06 rig for 6 meters FM simplex (hanging on the right top of the rack). An RF Concepts 2-417 amplifier, 170 Watts on 144 MHz (hanging on the right side of the rack). I used a box to switch the CW paddle and a headset microphone between the Yaesu and Kenwood. I used Yamaha headsets with a couple of clip-on beads to suppress RF getting into the mic audio. That had been a problem in previous contests. It was for this contest, too, but only for the FT857D. I ended up using the stock microphone for the Yaesu and the headset for the Kenwood. For, perhaps, the first time in a VHF contest, I didn’t build a new antenna or substantially modify an old one. This is similar to September, except that I moved the 6m antenna up to the middle position. Here were the scheduled stop times (local time). For the most part, I stuck to this schedule. My contest began shortly before 8:00am on Saturday with a three hour drive to Ocean Shores, WA. I am not a morning person, so I don’t remember much about the trip. I arrived at the Ocean Shores Airport parking lot with about 15 minutes to spare. Greeting me were some very friendly dogs that had just finished walking their owner on the airport grounds. The set-up went well, except for one little snag. The rotor box for the rear rotor emitted a guttural distress call upon applying power. On top of the ugly noise, I detected the faint odor of smoke–perhaps, it was just my imagination. I tried all the usual fixes—banging on the box, moving it around, unplugging the rotor connector, and banging on the box some more—to no avail. I had some choices to make. I could use the rotor control for the front rotor by swapping the six wires (there is no Molex connector for the front rotor because the connector is too big to route through the hole in the floor of the cab). This would require swapping the front rotor cable back at the end of each stop so that I could use the front rotor while in motion. This probably would have worked, but seemed a bit risky. Imagine if I forgot to swap cables back. Rotating the rear stack after the antennas are strapped down could bend some aluminum or break some wood. In any case, I figured it was just as fast to set up the front mast and the rear mast at each stop, point the rear antennas where they would do the most good, and use the front antennas for everything else. As the situation warranted, I would jump out of the truck and rotate the rear mast. I should have tested the rotors before leaving home AND brought a spare rotor box–I have a third control box at home used to turn my roof-top antenna stack. It would be simple to disconnect it and take it along. I started about 10 minutes late because of the rotor business. But I immediately worked Gabor, VE7JH/R, in the relatively rare CN78 on 2m and 6m. Not bad, considering we have a bit of the Olympic mountain range separating us. A flood of CN87 “regulars” came next, as people in the Seattle area swung their beams to the SW. A little later, I got Gabor on 432 as well! An hour of operating produced 26 QSOs and eight multipliers. Besides CN87 on 4 bands and CN78 on three, I worked W7VB in CN86. This was a good, but not great, result from this grid. In past contests, I’ve worked Oregon stations, and a local station in CN76. An hour and a half into the contest, I was set up a couple of miles to the north in CN77. This time the Oregon stations boomed in on 6m and 2m. I worked Gabor again on 2m, but missed him on other bands. In fact, I never heard him again during the contest. After an hour and a half stay, I was 37 QSOs and 5 multipliers (+1 for grid activation) richer. It takes about 2.5 hours to get from Ocean Shores to my next stop at CN86 in Kalama, WA. I plan a slightly longer route on hwy 8 to U.S. 101 that takes me to Olympia and into CN87 territory. The route adds ten minutes to the trip but avoids a more RF-dead U.S. 12 valley route. The first part of the trip in CN86, through the rolling hills of west-western Washington, was slow, with only five QSOs on 2m or 6m. Upon hitting CN87 in Elma, WA, things picked up, with nine more 2m or 6m QSOs in 25 minutes. I also worked Tom, KE7SW on 222 MHz. A few miles south of Olympia, WA I was back in CN86. This stretch of Interstate 5 is usually quite dead for me. But in the next hour I worked 18 stations on 6m, 2m or 222 MHz. Most QSOs were back to CN87 (Seattle area) or ahead in CN85 (Portland area), but there were a few spectacular exceptions. I caught KE7IHG/R in CN76 on 2m. And a few minutes later I was surprised to work (on 2m) KB7W in Bend, OR, CN93, on the other side of the Cascade Mountains. A few miles down the road, I caught KD1RX/R in CN84, as well. From my 1,700′ perch east of Kalama, WA, I spent an hour filling out my CN86 QSOs, with 37 more contacts including twelve on 432 MHz and five on 222 MHz. New grids worked were CN85 on 432 MHz with Bruce, KI7JA and CN97 on 2m with Gary, WA7BBJ. The next stop was a couple of miles to the south, just over the CN86/CN85 grid line, in the yard of friend at about 1,800′. The location gives me a locally unobstructed 200° view from north to southeast, with reach into Vancouver, Canada and Portland, OR. I pointed the big antennas south, hoping to reach the southern-most parts of Oregon. The nice thing about this location is that there are plenty of 222 MHz stations–I worked nine. For some reason I wasn’t getting into Seattle on 432 MHz, as I only worked Eric, N7EPD in CN87. Everyone else was in CN85 for the band. The highlight of this spot was working Barry, K7BWH/R, on 6m in CN73. Barry was out working the rare Oregon coastal grids. I heard him from a few spots on 6m, but only got through this one time. In all, I worked 45 stations while at this location. I also picked up a handful more from CN85 while in motion on the way to CN94. The “bonus” stop of the day was in N. Bonneville, WA along the banks of the Columbia river. I tried this for the first time in the Sept. 2013 VHF contest. As I suspected, I had good reach into Portland from this location, but nothing back to CN87. I did work Paul, K7CW, in September. This time, I made 21 QSOs in about 30 minutes, all of them into CN85. At one point I heard Eric, N7EPD, calling CQ on 6m (I think, possibly 2m), but he didn’t hear my response. I have a 6m FM rig that I’ve carried around for the last five contests. It works off a vertical on the cab roof. In a year, I’ve never made a QSO on the rig. So imagine my surprise when I heard a CQ on 52.525 MHz from Etienne, K7ATN, on Bald Peak in Oregon. We had “run the bands” in previous grids and had no problems making QSOs on all four bands. I left CN95 and traveled 2 hours north to a motel in Centralia. Repeated en route CQs yielded no new QSOs. After an overly-lengthy check-in to the motel, I hit the sack about 12:45 AM local time. My alarm went off at 5:45 AM for a 6:15 AM departure to the north. The Sunday route was rather different from last January in a number of ways. First, I hit some mountain locations this year–specifically CN96 and CN86 near the CN96/CN86/CN97/CN87 intersection. Last year, the snow put some of these spots off limits. In 2013, I hit a “bonus” grid of CN89 in the parking lot of the Peace Arch Park just south of the the Canadian border. That grid was not very productive, however. I didn’t return to it. That’s why CN95 was the “bonus grid” for this contest. The first 20 minutes of my morning commute were in CN86, and yielded no QSOs. Then I hit Olympia and CN87 and made 19 QSO over the next 75 minutes, including a handful of 222 MHz and 432 MHz QSOs. Next, I hit CN86 (again!) for a 15 minute crawl along a rough gravel road, climbing to 3,000′. After all the time I had spent in CN86, I still made seven in-motion 6m QSOs. The last was with Steve, KE7IHG/R, who was now in CN87. In CN96, sitting at 3,200′, I immediately worked Steve, KE7IHG/R, again. Using the front antennas, I proceeded to work the CN87 crowd on 6m, then 222 MHz, then 432 MHz and then 2m, for a total of 27 QSOs in 25 minutes before even getting a chance to set up the rear antennas. That initial burst of QSOs was followed by 34 more over the next 70 minutes. VE7DAY gave me a new grid (CO70) on 6m. And I even worked my neighbor Doug, AC7T, who was using a longwire antenna back in Redmond, WA. A few hundred feet down the road was CN86 (AGAIN?!?). I set up for a short visit, feeling I had tapped out this grid. To my surprise, there were 20 more QSOs to make, including a 6m QSO with VE7DAY in CO70, and a new multiplier from VA7MM in CN89 on 2m. A few stations popped up that I hadn’t worked while in CN96, so I went back to my previous location and snagged eight more QSOs on 6m and 2m. And then there were stations popping up in CN96 that I hadn’t worked in CN86, so I made my final excursion back into CN86, where I worked five more stations. A couple of miles down the road, and 1,000′ lower, is CN87. On the way down I caught one more QSO from CN86. It was K7MAS at Wilderness Peak on Cougar Mountain. Mark was participating in a Summits On the Air event using a 2m FM handheld. This CN87 spot is okay, but not spectacular, and I had already worked the easy stations in my two mobile stints through CN87. The next hour yielded 30 QSOs, primarily into CN87. The most interesting QSO was with Steve, KE7IHG/R, on 223.5 MHz who reported CN86, and then said he had just crossed into CN96—a new multiplier! This was fantastic news…I very rarely work anyone in CN96, although I activate the grid frequently. But this confused me. I knew that Steve was thinking of heading to the same CN96 spot whence I came. And the only way to get there was by driving by me. No car had passed me all morning on Mowich Lake Road. We quickly ascertained that he was nearby, having crossed the one lane bridge over the Carbon River, but that he had taken the left branch at the next fork in the road, and was heading into a deep canyon carved out by the Carbon river. I was on the ridge above the canyon. Steve turned around an soon came across me for an eyeball QSO with him and his wife, Jennifer. I wasn’t thinking very strategically, because I should have headed back 1/8 mile back into CN86 to work Steve in CN86 and CN96 and then returned to CN87. I’m not used to thinking about maximizing QSOs with another rover. I worked a few more stations in transit through CN87 on my way to CN97, including Steve when he got to CN96. My next stop was Mud Mountain in CN97. This 1,200′ flat-topped mountain located east of Buckley, WA sometimes yields interesting surprises. The two surprises were working VE7DAY in CO70 again. 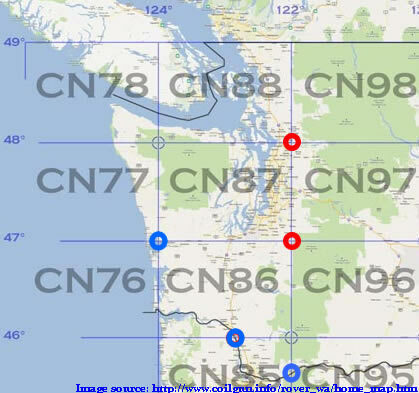 And then there was W7CNP in CN97, a contest club station in Tieton, WA. Tieton is located near Yakima on the east side of the Cascades. The big surprise was 51 QSOs! It helped that Steve, KE7IHG/R, was moving from CN96 to CN86 and then to CN97 somewhere in Buckley. But it seems like every CN87 station was on the air, with a handful of CN86, CN88, and CN97 stations along the way. Nothing from CN85, however. I left the grid 10 minutes behind schedule for a long drive through CN87 to CN88. There are several routes from Mud Mountain to Lake Steven’s High School in Lake Stevens, WA. The fastest route takes one through plenty of valleys (like Maple Valley, WA) and then along the I-405 corridor. The long route goes through Seattle, is relatively elevated, and passes through a much bigger population center. One risk is getting stuck in one of the Seattle infernal traffic jams. I opted to take the fast route, if only to spend more time at 3,000′ for my final stop. Another, more important, consideration was that the Seattle Seahawks were playing in Seattle for a shot at the Superbowl. The long route would have me driving right by the stadium at kickoff time. The traffic on that route would probably involve bad traffic. I did manage a couple of QSO along the way. The Lake Stevens High School sits at 400′ in a rather RF-noisy spot near the southeast corner of the grid. I’m always looking for better locations that are equally accessible and just as elevated, but haven’t found ’em yet. The rear antennas were set up pointing south; the front antennas were left down. I was pleasantly surprised at the number of people still contesting. I worked KE7IHG/R in CN87…he said he was on his way to join me at Lake Stevens High School. Fix stations relayed scores from the playoff game to the rovers. The big surprise was working KB7W in CN93 on 2m again! I worked Gary, WA7BBJ in CN97 on four bands. Oddly, the 222 MHz and 432 MHz QSOs were new multipliers. I did work a couple of stations in CN85, which is always a surprise from this 400′ location. Steve and Jennifer showed up and we quickly ran the bands. Our 223.5 MHz QSO gave me a new multiplier! I stuck around while they set up antennas and then bid them goodbye for my trip to CN98. CN88 was surprisingly productive with 52 QSOs and three new multipliers. I was running 10 minutes behind when I hit CN98 on my way to the other Green Mountain. I managed to work 15 stations in route from within a mostly closed-in valley. A dense fog slowed things down in the valley. As I approached the turn-off to the forest service road, the fog got terribly thick and smelled of smoke. I could see huge fires burning nearby. It was spewing out smoke, and the smoke particles probably made the fog worse. The experience of seeing a large fire through the fog was surreal. I got out of the truck to lower my front antennas—I learned in September that the route has numerous spots of low-hanging vegetation. Upon further inspection, I concluded that the flames were from an intentional, and managed, fire. One wood pile had trees stacked into a huge conical shape. There seemed to be a buffer around the fire. The Forest Service web site had mentioned that there was high intensity logging happening on Green Mountain. My guess is that they burn the waste at night. I was a little reluctant to drive up a forest service road with a fire—even a managed fire—near the exit. The situation was exacerbated by a thick fog that rendered navigation extremely difficult. But I know Green Mountain has a network of roads that provide an escape route to the north. And I had three different autonomous and independent GPS units on board that each mapped the forest service roads. One of them was on and providing navigation. The other point of hesitation was my fuel situation. The truck had just under 1/4 tank of fuel remaining, which was sufficient for the task, but didn’t give much of a buffer if something went wrong. Perhaps foolishly, I proceeded slowly up the road into an seemingly impenetrable fog looking for a 3,000′ perch. The fog was so thick that, at several corners, I had to stop and get out of the truck to make sure there really was a road to turn onto. The fog started thinning out over 1,600′, speeding up progress considerably. I celebrated with a couple of QSOs, including (again!) VE7DAY in CO70 on 6m. I’m not sure what, exactly, happened next. The talking GPS started giving bizarre instructions and distances to the waypoint. I suspect it lost satellite reception for awhile and didn’t give me a right turn instruction at some point. I didn’t see any side roads, but the fog might have made that difficult. Nor do I remember a loss of signal report from the GPS. So I kept going, up, up, up…to 2,200′ feet. The fog cleared up completely at that elevation. The road started descending a little; I started noticing features that were not on the route my last trip. After a long, slowly descending stretch, I determined with certainty that I was not on the intended route. I turned around and retraced my steps to a nice open pull-over spot at about 2,000′ and shut down the truck (to preserve fuel). By this time there was only 50 minutes left in the contest, I tried to make the best of it. The location was not particularly good. I didn’t bother marking my location on the GPS, but my best reconstruction has me on the north slope of Green Mountain, with the population centers to the south—on the other side of a big rock. Oh well. Only 14 more QSOs were made (for a total of 32), with either strong or nearby stations. Oh…and I got the news that the Seattle Seahawks would go to the Superbowl. The QSOs included a run of bands with Steve, KE7IGH/R, who was now at nearby Granite Falls High School at 400′—presumably a much better contest location than the one I was at. The four QSOs provided four new multipliers, which somehow makes the whole ordeal seem worthwhile. How cool is it to have another Rover around! My concerns going home were to (1) not get lost and (2) not run out of fuel before I could get to a petrol station. Prepared to do battle with a wall of fog on the way down, I practiced my best fuel conservation technique, keeping in mind the trade-off that brakes can overheat and fail on long downhill stretches of forest service road. The fog turned out to be a non-issue on the way down until I got close to the fire. Back in Granite Falls, I filled up the tank with 3 gallons less than the tank capacity. It was only after refueling that I could relax for the 75 minute trip home. I gave a few CQs on the calling frequencies of several bands. Alas, everyone had shut down for the evening. I went to 88.5 MHz and enjoyed the blues for the rest of the trip home. The contest results are summarized in the table below. The preliminary score is 644 pts × (37 multipliers + 10 grids activated) = 30,268. The score is a little better than my Sept. 2013 results of 27,922 (preliminary score). I did about the same on 6m, but had 18% more 2m QSOs, 22% more 222 MHz QSOs, and 13% fewer 432 MHz QSOs. I was pleased to make my first 6m FM QSO during a contest, but I really ignored FM on 2m and 432 MHz. In past contests, I would make a few more FM QSOs on these bands. I learned later that there was an FM-only station on Bald Peak that I never worked. Two meters was hot this contest, compared to September, where I used the same antenna, rig and amplifier. I’m not sure what the difference is except, perhaps, more activity on 2m SSB/CW in the region. The 222 MHz band was quite productive, but most of the QSOs were on FM. I didn’t use the transverter all that much. The drop in 432 MHz QSOs is probably the result of having no rotor on the rear antenna stack. Indeed, in both June and September, the QSO count was about 80 compared to 70 this contest. Carry a spare rotor control box! Use two independent GPSs when traveling on unfamiliar, foggy, or tricky forest service roads. I did this in September and found the right spot on Green Mountain in CN98. Make more calls on 2m and 432 MHz FM. I probably missed a few easy QSOs by not paying enough attention here. Sticking very closely to the schedule works. I noticed bursts of activity during the play-off game that probably coincided with game breaks. At least some stations knew I was scheduled to be in a new grid and used breaks to work me. Spend a few more minutes pointing east from elevated spots. There are a few E. Washington stations, like W7CNP, to be worked. I still need better headset, microphone, and audio management, particularly for in-motion parts of the contest. Carry more spare batteries! I briefly lost my main headband flashlight. The back-up light had low batteries, with no spares aboard. This is my third year of doing these VHF contests as a rover. I feel like the current rover configuration, set of route options, and operating procedures are coming close to tapping the scoring potential in the Pacific Northwest. Making substantial score improvements as a limited rover (without counting on Es openings) will require some rethinking to achieve scores over about 35,000 (without help from Es). I’ll be pondering these things for next September, and, perhaps, implementing some of them for June. Thanks for all the help Darryl.